Get two pedals in one convenient box. 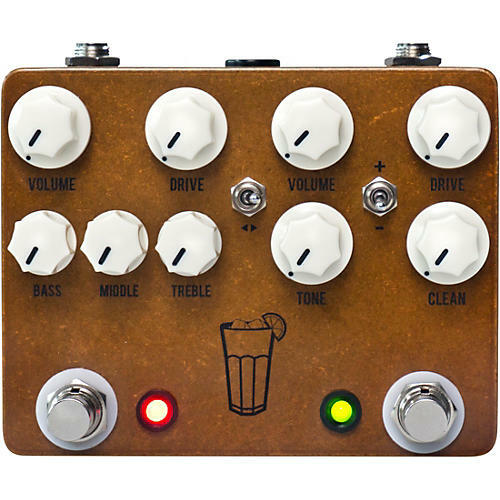 The JHS Pedals Sweet Tea V3 is the company's "Everything Medium-to-High gain 2-in-1,” and it covers all the bases from light breakup, blues, rock, heavy grind and more. The right side is the Moonshine V2, which is a highly unique and massively tweaked version of the most famous overdrive ever created housed in a little green enclosure. The Moonshine V2 has the classic mid-heavy tones that you’d expect but with more gain, volume and tones available than you ever thought possible. The Moonshine V2 has the same core tone as the Moonshine Version 1, has been given a “Clean” knob to blend in the perfect amount of clean signal with your overdrive signal. On the left side is the Angry Charlie, which is the Angry Charlie V3, one of JHS Pedals' most popular pedals of the last few years. High-gain JCM 800-type “Brown” sound tone that the designers believe is the most accurate Marshall tone ever put in a stomp box. It has volume, drive and the full bass, mid, treble tone stack like you’d find on the amp. With the full tone stack and the amazingly accurate amp tones in this circuit, you’ll be begging for more! The Sweet Tea V3 features the company's classic order switching toggle so that you can choose which circuit is first in the chain for the perfect stacking tones you’ve been searching for. With these tones combined or used separately, the Sweet Tea V3 is a gallon-and-a-half of overdrive that goes down easy on a summer night! This pedal requires standard 9V DC negative power, consumes less than 100mA.